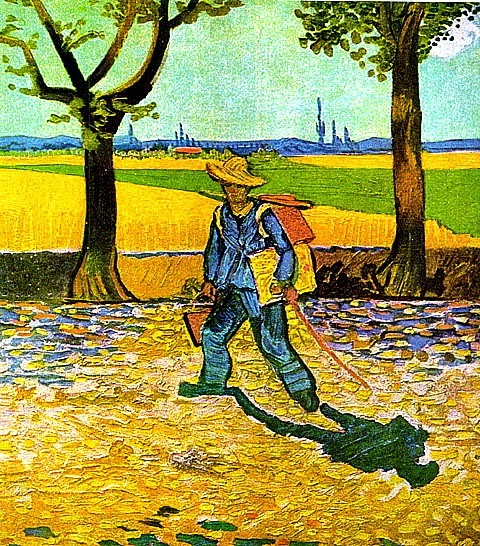 The painting on the Road to Tarascon is a self-portrait of Vincent van Gogh traveling with its artwork in 1888. It was seen as a lost masterpiece and a rare glimpse into van Gogh’s life as an individualist and a traveling painter. To him real painters don’t paint things how they are but they do paint them as they feel they are. Francis Bacon thought it was a haunting painting of van Gogh as an outsider to the world. Even though the artist is alone, hot, and following a path between Arles and Tarascon he will be meeting his friend Paul Gauguin in less than a month. Within a year of this time he had a seizure and within two years sold his first piece of artwork. With all of his life’s happenings his dark shadow indicates his only true friend is himself. The Nazi’s removed and destroyed the art as a degenerate for their culture. It was believed, at that time in history, that anyone not part of the overall Germanic bloodlines created art that was insulting to religion, Germans, and the world. Other artists were told not to paint if their art was not of sufficient Germanic qualities and regular inspections of their homes were common. Anything that did not conform was removed. 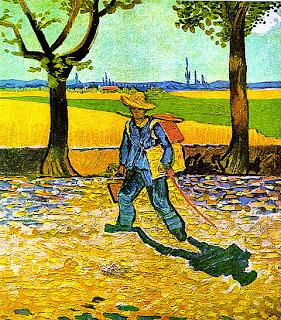 Vincent was a child who drew pictures and began painting in his late twenties. Over 2,100 paintings were produced and only six were ruined or destroyed. Much of his time was spent as an art trader and he desired to someday be a pastor. As he matured his works became stronger and brighter. It is believed that his distinct style contributed to his overall success as a painter. It was his type of signature.